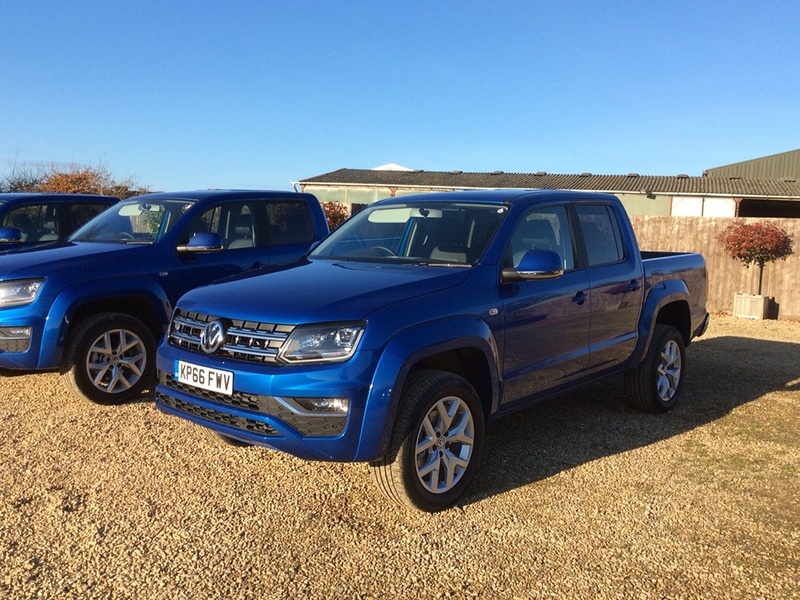 The Amarok has certainly done well for Volkswagen in the pick-up market, a part of the commercial vehicle market they did not feature in, just a few years ago, 6 in fact but they were brave and took on some well-established players. The new Amarok still looks like an Amarok, with just a few exterior visual changes, including revised bumpers and a new grille to give it the full Volkswagen DNA, it looks chunkier and bolder than it did before, which takes some believing. It looks even more purposeful and even more menacing if one is right up behind you and you see it in your rear view mirror. Under the bonnet is where the biggest change has occurred. The 2.0-litre four-cylinder engine has gone, finished, departed, left the pick-up and has been replaced by a much larger, though more efficient 3.0-litre V6 TDI and this engine is glorious and suits this car so well. The V6 produces 204ps or 224ps, with a smaller output 163ps arriving on our shores later this year. The new EU6 compliant 3.0 litre is the only six-cylinder model in the segment. Despite the larger engine and impressive performance, thanks in large part to standard BlueMotion technology modifications including Start/Stop, battery regeneration and modified engine design the 224ps Amarok returns 36.2 mpg on the combined cycle and CO2 emissions of 204g/km. Climb up into the cab and the changes are more prominent with an all-new dash panel design which incorporates Volkswagens MIB (not Men-In-Black) but their Infotainment system with a large touchscreen, radio, navigation, Bluetooth and DAB are also now standard features, plus new technology including the option of Guide and Inform, Car-Net and App-Connect systems. 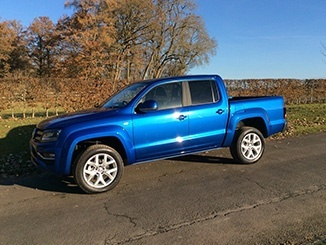 We took the new Amarok from the base camp, near the M40, out onto a dual carriageway, then onto the motorway for a good long stretch and you do sit high and feel king of the road and not at all vulnerable as you drive past large 40-tonne trucks or as they pass you. You feel ultra-safe in this rock solid vehicle. We then turned off the M40 and through some very pretty small villages. I needed to pop into a supermarket to pick up some food to take home for tea, or as they say down south, dinner, or if your very posh, supper and that is where the problem begins. The Amarok is 5.321 metres long, or in old money 17.3 feet long, and 2.228 meters wide, which is 7.3 feet wide (including the door mirrors) – so not exactly a small thing, in fact its blumming huge, especially in a small supermarket car park. It sticks out at the back, and you struggle to open your door, as car parking places seem to be getting narrower. In this big thing, it makes it doubly tricky to get in and out it’s a good job I’m thin! The shopping trip was complete so it was time to head back to base camp. This new engine is so quiet and refined you can hardly hear when cruising at 70mph on the motorway. It has more than enough power when setting off at traffic lights, road junctions or roundabouts, it is such a nice vehicle to drive in all conditions. But this is a work-horse and is designed above all to do a job. The cargo area is 1.55 metres long and 1.62 metres wide, allowing a euro pallet to be loaded transversely and has a maximum payload of 1,154 kg – depending on the model, it can also tow loads of up to 3.1 tonnes. The Amarok Double-Cab is a true five-seater, with enough room for five adults, even if they are hefty site workers or large well fed farm personnel, none would complain they were short of leg or head room. The new Amarok, with its new engine and slightly changed front end is such a good all-rounder; it carries plenty, tows plenty, plenty of room, plenty of power, and plenty of road presence. Prices start from £27,242.00 OTR (Plus VAT) and go up to £32982.00 OTR (Plus VAT), prices for the lower powered 163ps will be announced nearer its launch date.